2018 Open Enrollment Begins February 1st! 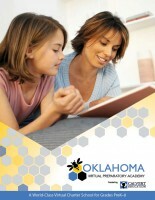 Oklahoma Virtual Preparatory Academy will give your child a well-rounded education outside of the traditional classroom. Backed by some of area’s best teachers and using the world-renowned Calvert curriculum, OKVPA provides the advantages of a virtual public school at home, tuition-free to Oklahoma students. Students complete assignments supported by a Learning Coach, who is usually a parent or guardian. Students learn using a blend of printed, hands-on and online resources. Students and families can meet and collaborate with other OKVPA students throughout the year.